Keeping up with the Laughlins...: Essential Oils...Young Living...I'm LOVING them! Essential Oils...Young Living...I'm LOVING them! A few months ago I decided to jump in and try these oils that a few friends were talking about. I did a lot of reading about the kinds of oils that are on the market because I knew nothing of this stuff and I did some price checks. 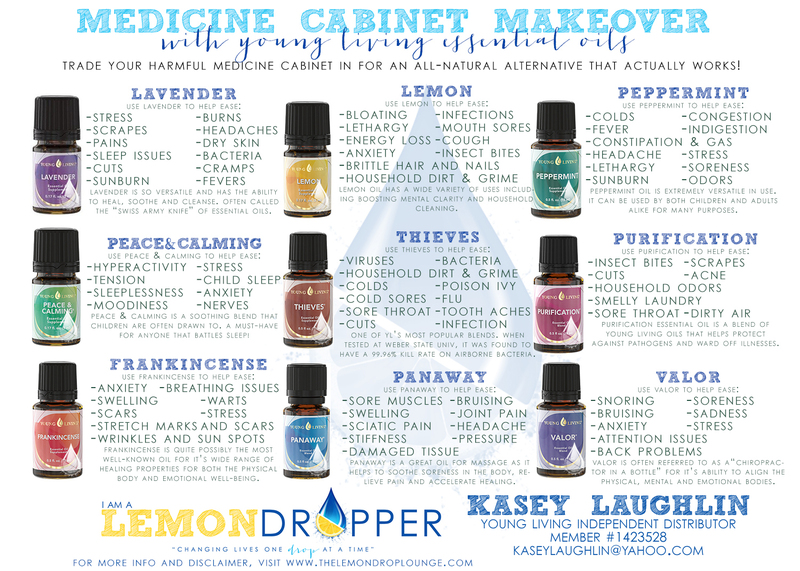 Young Living is the company that I started using because of the price, the therapeutic grade (which means they have no additional chemicals or additives and they're safe to ingest) and the reputation of the organization. I was so sick of giving my boys medicine every.single.day. for something or another. Medicine for allergies, stomachaches, fevers, bug bites, eczema and dry skin, and the list goes on and on and on. I was tired of spending money on medicine that did not work. So...I tried another type of the same medicine....usually that didn't work either. Money going down the drain from medicines that weren't working or helping the boys (or us). Medicine that all listed some sort of side effects from using them. Lavender for scrapes, burns, allergies, headaches and pretty much anything you can imagine. Peppermint for digestive issues, congestion and headaches. Lemon for cleaning and detox. Thieves for when we are sick or feeling like we might get sick (I now use Thieves whenever we go somewhere out of the house). So I ordered the Everyday Oils kit so that I could try some of the other oils as well (like Panaway and Frankincense that are pricey outside of the kit and they're included) and I ordered a diffuser. The total of the oils separately in the 15ml size is $407.24 and the kit was only $150, so yea, it was a no-brainer for me. Look, I'm not trying to sell anything to anyone. PERIOD. If this sounds like a bunch of BS to you, great, no prob. I thought it was too, at first. 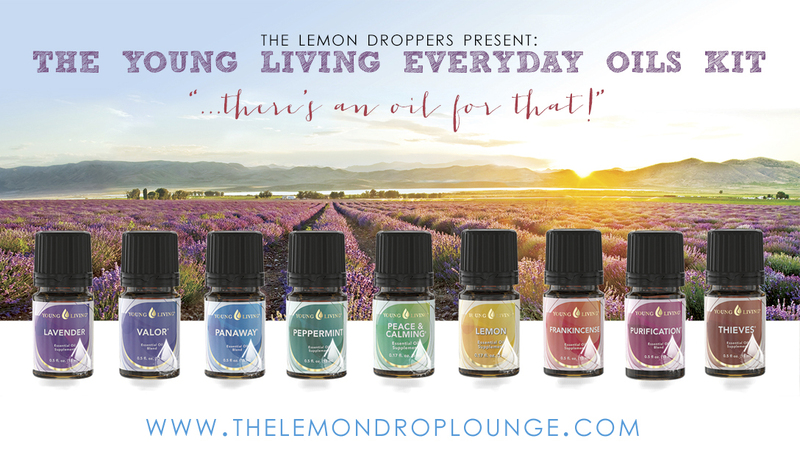 However, if you want to try the everyday oils kit here's info on how to do that. My member is #1423528. 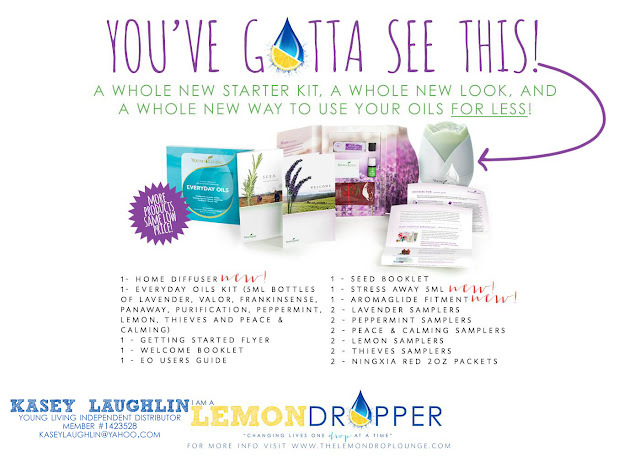 Bonus: The Everyday Oils kit comes with a FREE (98$) diffuser, samples and a Stress Away roll on. Have questions? Ask away. Have a symptom? Let's research it. I have a facebook group dedicated to this, so come join us, just let me know. I signed up for autoship, which is amazing. It is a way to save you money. Essential Rewards is the "autoship" program from Young Living. Let's face it, the term "autoship" FREAKS people out. It does me at least. I personally knew after using these oils that I would be ordering a minimum of 50PV ($50) a month. This is a new "way of life" for my family. I'm trying not to run to Motrin, Tylenol, Nyquil, Robitussin, Ambien, the list goes on and on, for every little thing my family faces. With that being said, I KNEW I wanted to invest in oils and learn what works best for my family. I knew there were going to be some oils that I NEVER wanted to be without (lemon, thieves, peppermint)...so for me $50 a month I knew I would do. 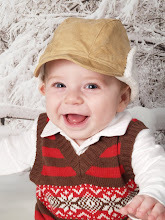 I'm okay with cutting out a new outfit or eating out one less time to work on this baby step with my family. I really did look at it as an investment. When you sign up for ER (Essential Rewards) you get a cheaper shipping rate, AND you earn credits for free oils. That sold me right there. Once you are an ER member, there is NO obligation to STAY an ER member. You aren't signing your life away for a year. You aren't going to have to pay a fee for "dropping out"...if you want to quit ER, you quit ER, no questions asked. That made me feel A LOT better. Another thing I like about ER is that you can change your ship date each month. If you want it to ship on the 15th one month and the 29th the next, you just change it.You can also change the oils you order each month. It doesn't always have to be oils either...it can be their lotions, cleaning supplies, etc. LOVE that! Go ahead and read this post from my friend, Lindsay, who wrote a blog post about trying the oils with her and her family...After reading her post I decided to jump in with both feet. 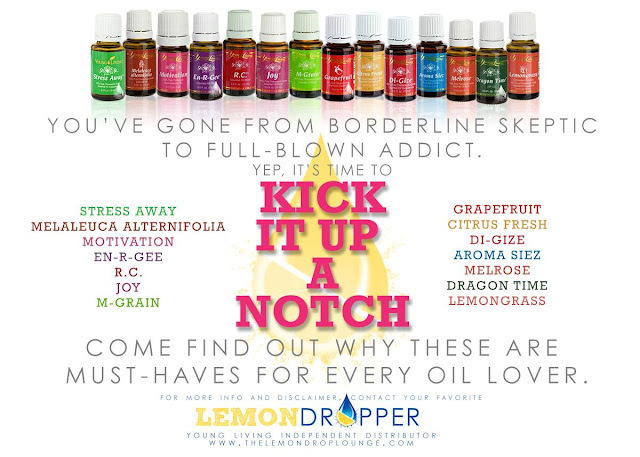 Initially I wanted to "do the business" as a way to get my oils paid for each month. I was using Peace and Calming every night, as well as Lemon/Lavender/Peppermint for allergies/weight loss. The more I started talking about it...the more people were interested. In April I signed 2 people who wanted to try the kit. I had 7 total members on my "team". My check that first month was $112. That almost paid for my kit! In May, I sold 4 more kits and now had 9 people...my paycheck for May was almost $250! That definitely paid for my oils for that month and let me try a few more new ones! I never expected just by talking about the oils and seeing how they could help other people would be a great side job....but it TRULY is! I get to help people and help our family financially!